A single picture acquired in 191 3 is anterior to the nineteenth century. 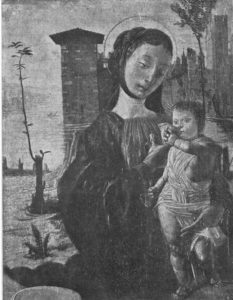 It is a Madonna attributed to Bartolommeo Suardi, whose intimacy with Bramante and whose care to follow Bramante’s second manner gave him the surname of “ Bramantino,” the ‘‘little Bramante.” The Milanese School developed late, playing but a small part in the early Italian Renaissance. Nevertheless, it rapidly acquired distinction and exercised an influence upon French and Flemish artists almost as important as that of the Florentine School. The Museum of Fine Arts has possessed hitherto of this school only the “ Portrait of a Man,” by Andrea da Solario, acquired in 191 I. In future it will be able to show another work whose charm and interest are not inferior. The accompanying reproduction makes a long description of this picture unnecessary. Specially worthy of notice are the charm of the elegant figure, the picturesqueness of the town in the right background, the delicacy of the river running among bluish mountains, suggesting already the landscapes of Leonardo da Vinci, and the tree partly cut down, necessary to the balance of the background, and in which one may see perhaps a symbol of paganism overthrown, while the young branch full of sapevokes the idea of the newly nascent religion. The coloring is of a rare harmony and extreme delicacy. The Museum has already a celebrated picture by Turner. The “Slave Ship” shows the master in the full force of his ardent fancy. It was exhibited at the Royal Academy in 1840. It seemed very desirable to show him also at the outset of his career, when, freed from external influences, he began to unfold his personality and to lift himself in lyrical flights above contemporary landscapists; and all the more desirable since Mr. Francis Bullard’s magnificent bequest has made the Museum the richest in the world in Turner engravings. It could not have been hoped to acquire a work more important in itself and more characteristic of Turner’s early style than the “ Falls of the Rhine at Schaffhausen.”’ If the picture is not as well known as it deserves to be, the reason is very simple ; it was shown three times only in England during the nineteenth century and at long intervals : at the Royal Academy in 1806, at the Manchester Exhibition in 1857, and at Burlington House in 1879. It was reproduced but once and very poorly in line engraving in the catalogue of the collection of Ssr John Heming Leicester. Bart., at Tabley House, which appeared in London in 1825. To understand the importance of the work, it must be remarked that the cartiest characteristic pictures of Turner do not date before I 797, when he made his first journey to the North. The following year he exhibited pic- tures and drawings at the Royal Academy, among them “Norham Castle,” which served to draw attention and to ensure fortune to their author. His exhibit of the following year. “Kilgarran Castle.” accompanied as usual by sketches and watcr-colors. shows the influence of Wilson. Then, in 1800. it is ” Dolbadern.” ” Caernarvon.” etc. Two years later he was to give the first of these pictures to the Royal Academy on the occasion of his election. He exhibited in 1801 ” Pembroke Castle,” and during the same year made a trip to Scotland. Then, profiting by the Peace of Amiens, he went to France and visited Switzerland for the first time. The impression Switzerland produced upon him was enormous and had the happiest influence on the formation of his talent. He ex- ecuted a great number of drawings full of force and sincerity, disengaging himself completely from the external influences which can be traced in his anterior works. It was this tour on the continent and among the mountains that revealed Turncr to himself. In 1802 he exhibited several views of France and Switzerland, but for a long time after- ward he was to make use of his sketches and memories for important pictures. The exhibition of the “ Falls of the Rhine ” in 1806, has led to the belief that Tumer made in 1804 a second voyage to Switzerland and the Rhine, for several of his views of Switzerland bear that date. Given the rich documentary material regarding Turner, these drawings are neither numerous nor important enough to prove this second journey, which is not confirmed by any other document. Sir Walter Armstrong and other critics do not believe it was ever taken. The Falls of the Rhine” may accordingly have been painted from sketches dunng the journey of 1802 and from memories. Indeed, a number of sketches by Turner of this place are known. The National Gallery has eight (Nos. LXXIX A to E, CXVIII, CCCLXIV, 287 and 337). Only the first five of these were actually executed during the trip of 1802. The others are later than the present picture. Still others are preserved at the Tate Gallery in Birmingham Art Gallery, in the National Gallery of Scotland, at the Fitzwilliam Museum. Cambridge (Ruskin Donation. 1860, and ui the collections of Sir Donald Currie, Rev. W’. Kingsley. H. B. Brabazon, Esq.. and others. They prove the interest that Turner took in the beautiful view of which he painted only this picture. The subject well suited hss mood at the moment. He had interested himself in painting marines, great masses of water in movement, tempests, drawing very attentively the details of an agitated sea, which he was later to obscure in vapor. The National Gallery contains the famous “Calais Pier,” ex- hibited in 1803 ; the Royal Academy, “ Fishing Boats in a Stiff Breeze,” and above all, “The Shipwreck: Fishing Boats Endeavoring to Rescue the Crew,” painted in 1805, and exhibited the following year in Turner’s studio. It is worth noting that Lord Tabley was one of the first English collectors to open his gallery in London to the public, an example which has been imitated with great liberality, and whose happy tradition persists to the present. The “Falls of the Rhine ” is hence one of the most important, the most typical and the best pre- served of the early works of Turner, whose genius may have developed, but who may from this moment be considered as one of the gTeat landscapists of all time. He executed the picture while already engaged on the landscapes of the Liber Studiorum, which were to appear the 20th of January, 1807. There is no doubt that Mr. Francis Bullard, who made this Museum the richest in Turner prints, would be happy at its acquisition of so notable a work of his favorite artist.